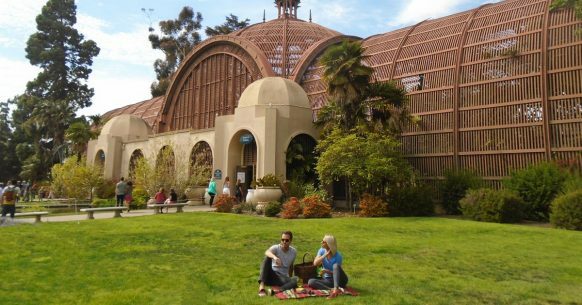 One of the best ways to soak in the splendor of Balboa Park is with a leisurely picnic. The good news is there are picnic spots for every age and desired experience. Picnics with the little ones are best when there is plenty of room for them to roam. One good location to head for are the expansive lawns just off Sixth Avenue. Sefton Plaza, with its statues in honor of park pioneers, is nearby for a little history lesson as is a playground and lawn bowling – though that is mostly a spectator sport if you are not a member of the club. Another good kid-friendly location is the area just off park where there is the large, and often crowded play area, is the Pepper Grove Playground. For those who are planning impaired, never fear a picnic in the park is not only possible but entirely plausible – not to mention convenient. Just head over to The Market Place, located a block away from the west end park at 2061 Fifth Avenue, where you can find all sorts of perfect picnic snacks from hummus dip and chips to ready-to-eat side salads like feta pesto pasta and potato. It also has a great made-to-order sandwich selection including everything from a turkey club to a caprese to pulled pork. Grab some goodies and get over to the park. For many a picnic isn’t a picnic without a little pick-me-up that a nice glass of wine (or maybe a cold craft beer) can provide. Luckily, Balboa Park offers a few areas where you can BYOA (bring your own alcohol) and indulge – responsibly – between noon and 8:00 PM. While there are nine designated areas, which you can find listed here, not all locations are created equal. Take the Mall Lawn, for instance. It is essentially two small sections of grass separated by a road that leads out of the typically busy Alcazar Garden. Hardly the spot for a relaxing meal accompanied by a bit of wine. In fact, parking lots surround a lot of the park areas that permit alcohol. If you are looking for a scenic and more soothing location, head over either to the East and West lawns outside of the Botanical Building. Both have a picturesque view of the Lily Pond and plenty of sunshine. If you like your picnics a bit cozier, head on over to the International Lawn, which is surrounded by the quaint cottages representing countries as diverse as Iran and Ukraine. On most Sundays, there is a performance between 2:00 PM and 3:00 PM by one of the international houses and the other houses are open to offer a sampling of cultural treats from food to art. While alcohol is permitted in these areas, glass bottles or glass of any kind is not permitted in Balboa Park. Don’t let that thwart your plans as boxed wines have upped their game in recent years. Some of the better options include Bota Box, which offers different varieties from Chardonnay to Malbec, La Vielle Ferme Red Blend or Bandit Pinot Grigio. Also, many of San Diego’s best craft beers come in a can such as Modern Times’ Lomaland, a Belgian-inspired ale, or the Indian Pale Ale Habitus from the Mike Hess Brewery. This entry was posted in Dining and tagged balboa park, culinary by Jennifer Davies. Bookmark the permalink.